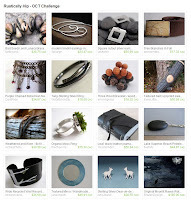 It's time to vote for your favourite treasury curation in our first OCT Challenge of 2011. 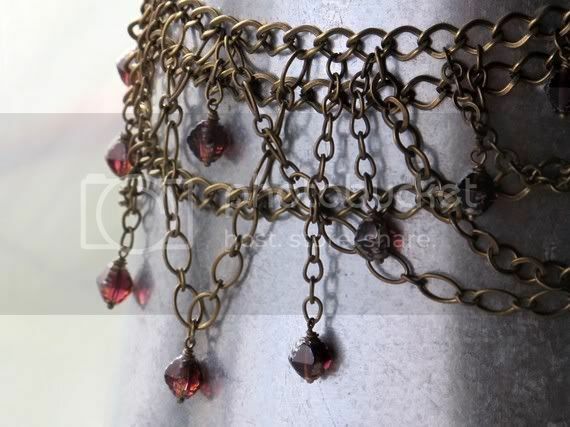 The last winner DarkRide chose her amazing Purple Chained Bohemian Necklace as the inspiration piece for this round of OCT Challenge entries. 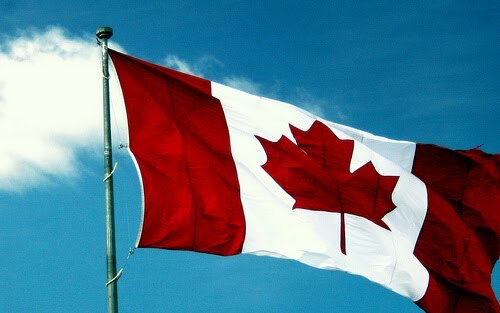 We had an amazing response from our Oh, Canada! 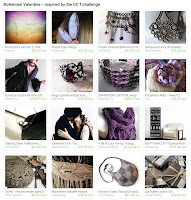 Team with 23 creative and beautiful treasuries. We have narrowed it down to 4 outstanding collections! 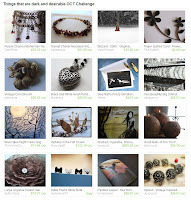 Have a look at each of these treasuries, then choose your favourite in the poll at the right. 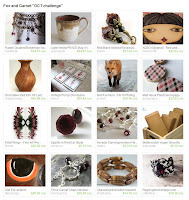 The winner will pick a piece from their shop for our next treasury challenge. Voting is open until Sunday February 6th at 6pm EST. 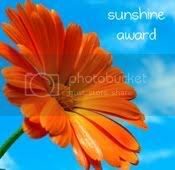 The winner will be announced on Monday Febraury 7th. Thank you to all who participated and for voting. Good Luck to our four finalists! This week's Friday Finds features the work of Janson Pottery from Ontario. 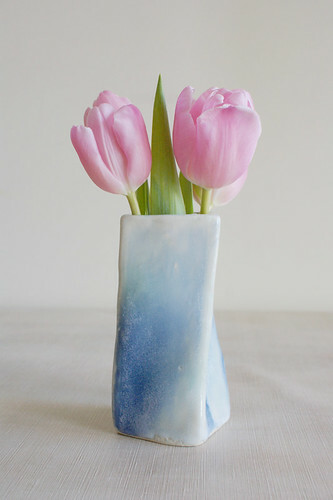 I love this twisted vase with the muted blue and green colours over a base of white. The twist gives it a bit of character. In this shop one will fine an eclectic offering of handmade pottery items: cups, bowls, plates, tiles, vases, and even some beads and jewelry! These items are perfect for someone who loves pottery and appreciates the time and skill it takes to create these pieces. Valentine's Day is a day to say to the one you love, "I thought of you today." It's a small gesture that means a lot to your special someone and it usually comes along with a gift. A card, flowers, chocolates, jewellery, etc. Whatever you decide to give to your sweetheart, it is the thought that counts and it will most likely be appreciated. I have selected a few handmade creations from some wonderful talented Canadian artists to help you find a gift or to inspire you to make your own. Gradient Necklace In Silk Ribbon Embroidery. So beautiful in white and shades of grey. This piece is definitely a conversation starter. It is what I like to call a wearable work of art. You can find this wonderful embroidered piece of jewellery at Bstudio. Hemp Scrubbie Tawashie Your Face. These are just wonderful. They come in a set of four. I have personally had the pleasure of using these on my face and I love them. They are a staple in my bathroom. You can get these facial scrubbies at The Art Of Zen...Crochet. Very modern and ultra chic women's top in black and grey. What a classic piece of clothing. I love this color combination as well as the kimono sleeves. If you're looking to offer your special lady a great looking top this is the one. Get this soft and stretchy shirt at Bird Apparel. Ring Holder. Coiled Mini Basket. Pretty ring holder or organic piece of sculpture. This basket is made with hand dyed thread and adorned with a lucky stone. I love the idea of giving anything that has a lucky stone. It just seems magical. This would be a really unique way to propose. You'll find this lovely creation at Wavesong. Striped Wool Sweater Bear Doll Boyfriend Softie. Are you single? Get yourself your own gift. Get a boyfriend doll and forget all about teddy bears. What an original huggable doll to give yourself. He really makes a great boyfriend. Never says a word and is always there when you need him. Get this adorable softie at Yermit. Here it is. That Valentine gift that has both red and hearts in it, but it is not your typical love note. These are so beautiful, creative and handmade with love. Perfect for Valentine's Day. These come in a set of four and are great for hiding secret love messages for your sweetheart. Get them at Kraze4Paper. This one's a great guy gift. It is a replica of an actual official hockey puck. Not only does it look great but it smells great too. Though no guy would probably admit to this I'm sure they all enjoy a good lather which is what this quality handmade soap has to offer. Get this one at Maple Creek Soap. Upcycled Computer Circuit Board Key Ring. What a cool idea for the geek in your life. I put this in the guy section but this can easily be a girl gift too. It's a great way to be environmentally responsible and look cool doing it. Is this the perfect gift? Head on over to Clone Hardware. A beautiful porcelain dish in the shape of a heart. Fill it with candy, chocolate, or other sweets to give it to your loved one. It is the kind of thing you will treasure for years to come. Find this lovely soft blue and white dish at Janson Pottery. Unisex Eco-Friendly Scarf Or Wrap In black. This beautiful hand knit creation can be worn by either a man or a woman. I have placed it in the guy section but this would make a beautiful present for the lady in your life. It is so versatile and can even be worn over your hair like a hood. Beautiful color contrast with the two tones. You can find this eco-friendly gift at Anny May. Ladies, this is a stunning work of art. This cuff is an original one of a kind piece of jewellery. The colors and textures are wonderful to look at and this would make a great gift for any man who enjoys wearing cuffs. Plus, you can borrow it anytime you want. You'll find this unique piece at Wabi Brook Studio. Here's another original and environmentally responsible gift for the game lover in your life. These cool cufflinks are made from vintage bingo/lotto markers. They are the perfect shade of red to be given on Valentin's Day. Get this cool find at Berry Sweet Treats. At first glance this looks like a photograph, until you see the artist's signature in the right hand corner! Today I am featuring the talented work of artist Brazen Edwards-Hager of BrazenDesignStudio﻿. Her shop is full of beautiful and orginal artwork featuring a nature theme. Animals and flowers feature strongly in her work. Her medium is watercolours in bright and vibrant colours. Her shop features original works, prints, cards, and she accepts commissions to paint portraits from photographs. What a lovely gift to give someone! The 2011 Team Treasury Challenge has begun! Congrats to DarkRide for winning the last challenge of 2010 with this lovely T.
The Challenge will end on January 28th at midnight. Over the weekend we will gather the votes for the most popular T.
What a wonderful idea for displaying photos - this beautiful memory board has been created by jensdreamdecor. These creative and useful boards are the perfect idea for gift giving! She has a wide variety of different colours and patterns to suit your needs. Jen's shop also offers pillow covers and wall hangings. 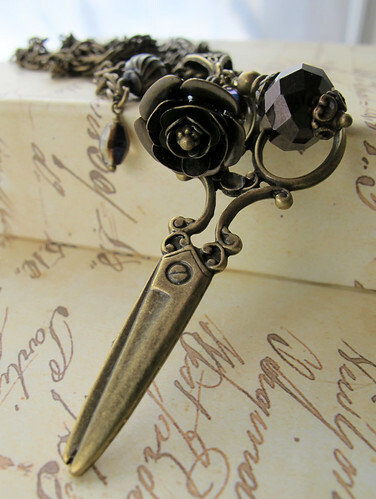 A vintage styled necklace by Dark Ride featuring charming brass scissors and brass roses. I have admired this team member's jewelry since she first opened her shop! She has truly found a niche that is uniquely hers. Her style? Vintage meets goth meets Victorian meets fairytale. In her shop you will find gorgeous necklaces, bracelets and earrings.